Worldwide Opportunities on Organic Farms—WWOOF! Home/Barefoot Gardening/Worldwide Opportunities on Organic Farms—WWOOF! WWOOF is not a hound dog—it’s a worldwide organization and effort to link visitors with organic farmers, to promote an educational exchange, and to build a global community conscious of ecological farming practices. WWOOF was founded in 1971 in the UK, and is one of the world’s first educational and cultural exchange programs. Today, WWOOF is in more than 132 countries around the world (and growing), with a wide range of farm-stay opportunities. WWOOF programs operate independently in each country, so please contact individual WWOOF organizations directly for the most accurate information on WWOOFing in the locale of your choice. 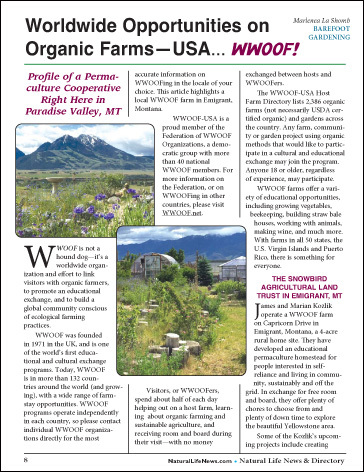 This article highlights a local WWOOF farm in Emigrant, Montana.